Posted October 24, 2016 by werlingsonsinc_admin & filed under Canned Meats, Recipes. 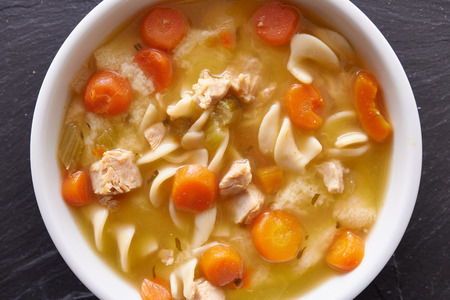 Chicken noodle soup is a long-time favorite cold-weather meal. There’s something about a bowl of piping hot homemade chicken noodle soup that just hits the spot on a cool, fall day or cold winter evening. Fortunately you don’t have to spend a day slaving away to make a great soup with canned chicken from Werling and Sons. Homemade soup always beats soup from a can. Making soup yourself allows you to control the ingredients and make it just the way you enjoy. Want more carrots or celery? Add them! Less spice or rice instead of noodles? Go for it! You may think that making homemade chicken noodle soup requires the time-consuming step of preparing and parboiling chicken, but there is an easier option. Simply use canned chicken with broth from Werling and Sons Inc. for a fast and easy soup. Our canned chicken is available in both 14.5- and 28-ounce cans to accommodate soup pots of all sizes. Making chicken noodle soup using canned chicken could not be easier. You can use the chicken just as you would in any soup, but without the need to cook it first. Start by cooking any vegetables that you want in your soup. Carrots, celery, onion and peppers are all popular ingredients, but you can add any vegetable that you like. The vegetables can be boiled, sautéed or steamed depending on your preference, and add any extra seasonings you like – rosemary, parsley, thyme, black pepper or sage, for example. After the vegetables are cooked, add them to a soup pot. You can also add the water that you cooked the vegetables in if they were boiled. Many people also like to add chicken broth to the soup instead of water to increase the chicken flavor, and each can of Werling and Sons’ chicken comes in broth, meaning you can pour the can right in. Simply bring the mix to a low boil, add your noodles, and cook until the pasta is tender. This recipe can also be used with a slow cooker. Add all ingredients except for the noodles, and allow it to cook for several hours. Add the noodles about 30 minutes before you want to eat. Don’t forget that when using a slow cooker, pasta will get soft and mushy if cooked for much longer than 30 minutes. You can order your canned chicken from Werling and Sons online and either have it shipped to your home or pick it up at our facility in Burkettsville, Ohio. Find out more by giving us a call today at 888-375-1998.